Joint blended module and recource package for entrepreneurship education. These will be accessible and open for all after the project life span. International intensive course curriculum for entrepreneurship education. Three intensive programme pilots serve curriculum development and internationalisation of education. Digital platform, Community of Practice charter and research publications supporting dissemination, exploitation and sustainability and accessibility of education. Teacher community of learning and international peer learning models applicable by other HEIs. Three teacher training events serve the development of models and tools. The main result of ECMT+ is modernised and coherent higher education, whose operation serves the economic growth boosting graduate employability, businesses and entrepreneurship. The results will be exploited on local, regional, national and European level in all the partner countries. 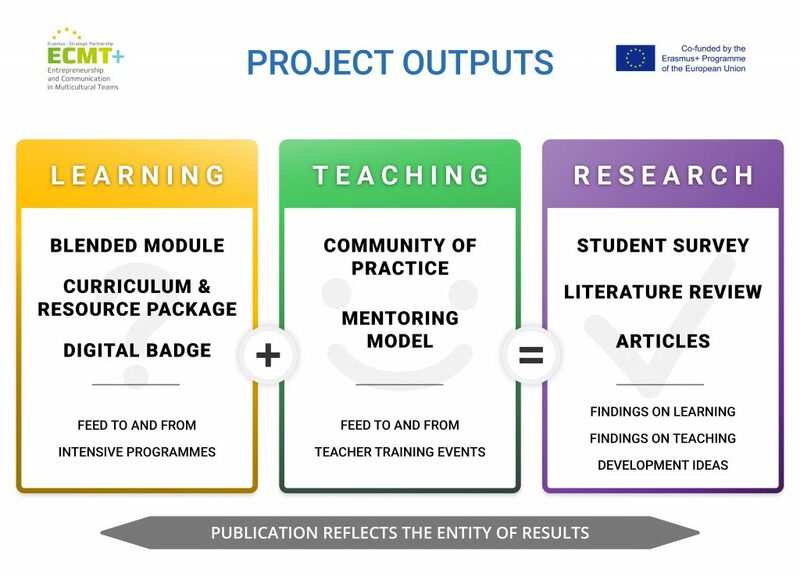 The impacts are varied; the ECMT+ course, blended module, digital learning materials and tools, community of practice, research journals and dissemination materials benefit all the stakeholders in a short and long run. ECMT+ builds human capacity and its impacts reach from local to regional and international levels. The direct beneficiaries are the staff and students but also working life partners. In a long term, also local business and people living in the regions will benefit. ECMT+ builds pathways between educational organisations and regions and promotes participatory cooperation, brings transparency to the development work and its achievements as well as promotes new applicable tools for entrepreneurship education. The international network brings added value enabling the co-creation of knowledge and flow of best practices from region to region across the borders. The impacts of the ECMT+ will contribute to long-term expertise and entrepreneurship in the regions. Badzińska, E. (2017) Empirical Study on Intercultural Collaboration in Project Teams: Preliminary Research Findings, Journal of Intercultural Management, Volume 9, Issue 3, Pages 29–44, ISSN (Online) 2080-0150. Badzińska, E. (2017). Evaluation of a Multicultural Approach to Teaching Entrepreneurship: Selected Research Results within the Framework of the ECMT+ International Project. Proceedings 13th International Conference on Social Sciences 06-07 October 2017 Vienna, Volume III, ISBN 9788890916137. Badzińska, E. (2017) Evaluation of a Multicultural Approach to Teaching Entrepreneurship: Selected Research Results within the Framework of the ECMT+ International Project, European Journal of Social Sciences Education and Research, [S.l. ], v. 11, n. 2, p. 320-327, oct. 2017. ISSN 2312-8429. Dziamska Z., Grzegorczyk J., (2018), Cooperation in Multicultural Teams – Experiences related to the ECMT+ International Project, Acta Universitatis Nicolai Copernici, Vol 45, No 1, pp. 93-104. Heinz, K., & Chylková, M. (2017) Development of the European Project Erasmus+ ECMT - Evaluation based of the European Project Erasmus ECMT In: prof. Ing. Tomas Kliestik, Ph.D. Globalization and Its Socio-Economic Consequences. Proceedings (Part II.) 17th International Scientific Conference Globalization and Its Socio-Economic Consequences. University of Zilina. Rajecke Teplice, Slovak Republic. 4th – 5th October 2017. p. 636-644. ISBN 978-80-8154-212-1. Timonen, L. 2018. Developing Transversal Competences and Skills. HAMK Unlimited: Journal. ISSN 2343-4708.